The rest of your website is a conversation between you and your visitors, but somehow the Contact Us Page just becomes a list of different ways to get in touch with you. And the ironic thing about most Contact Pages is that it doesn’t give your visitors the best way for most people to get in touch with you… a phone number. Perhaps we should rewind. Do we really want people to contact us? The answer doesn’t have to be “Yes.” But if you really want people to contact you, then the purpose of this page is to make it dead simple for a person to get in touch with you. So you probably want to include a phone number, but only if you really want people to get in touch with you. So our first tip when creating the internet’s most inviting contact page is to make it dead simple for people to get in contact with you. For most websites that will be one of three ways: Email, Phone, and a Contact Form. Now, how can we make the Contact Form the most inviting Form ever? Research has proven that the more information we have to put into those forms, the less likely people will be to complete the forms. So keep your Forms short and sweet. Do you prefer to talk to prospects on the phone or write them email? Choose the method you like the best and don’t even include the other one on the form. Let’s try to eliminate as many Form Boxes as we can and still accomplish our goal for the Contact Page. What is our goal for the Contact Page? If you said the goal was to get people to contact you, you would only be partially correct. Don’t you really want people who contact you to hire you for a project or get an answer to a question so that they will purchase a product? The Goal of your Contact Page is really to close a sale isn’t it? So let’s weave that into your contact page. When we started talking about Contact Pages, we mentioned that like the rest of your website, you are writing a conversation with your visitors. You’re showing them around and talking with them about the problems you solve and who you love working with. Now they’re come to the end of the tour and they know a lot about your business and you want them to take the next step. For years, I didn’t have a Contact Page on my website because I couldn’t see the point. I added my contact information on my About Page and I was happy to remove one more link from my Navigation Menu. But recently I’ve added the Contact Page back because I learned how it can be a useful tool to help me make sales and generate more business. Use these tips and my format to rework your Contact Page. 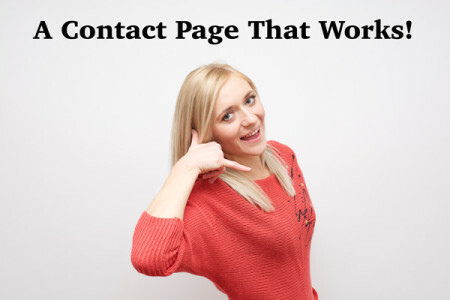 You’ll transform your probably unfocused and ineffective Contact Page into a lead generating machine.